Once I went to a wedding in Kansas City, my husband and I were there for a whole weekend. On the day before the wedding the guys "played golf' and the ladies "lunched." I was still in my twenties and my appetite was not dainty. (It still is not dainty.) Lunch was a scoop of shrimp salad on a piece of lettuce and dessert was a cookie. On my way back to the hotel I stopped in a bagel shop and bought: a bagel, egg, cheese and bacon sandwich. I looked across the counter and there was another woman from the luncheon having the same thing. We just smiled at each other, polished off our sandwiches and met up at the pool. She became my best buddy that weekend. Needless to say this week's French Fridays with Dorie recipe made me think of a ladies lunch. The original recipe called for raw scallops. I don't have a "fish store" that I feel confident about buying fish to eat raw, so I substituted "salad shrimp." For a ceviche the flavors were very tame. I think of cilantro, lime, and chiles when I think of ceviche... but such a bold dish would not go over well with the French or the ladies who lunch. I whipped up the original recipe's marinade and tested a few shrimp in it... I was not surprised that it was too sweet for my palate. I went back to work modifying the recipe. Keeping most of the original ingredients sans the brown sugar; I added a lot less tarragon, and I had to "kick it up" with a dash of hot sauce at the end. The result was a tasty lunch that only I seemed to enjoy. The kids did not like the tarragon. I wish I used cilantro, that would have gone over better.. my kids are used to Spanish/Mexican flavors..oh yes, and my husband well, he didn't get to taste it at all. He's skiing in Telluride, CO with his college buddies, one of whom got married in Kansas City many, many, moons ago. 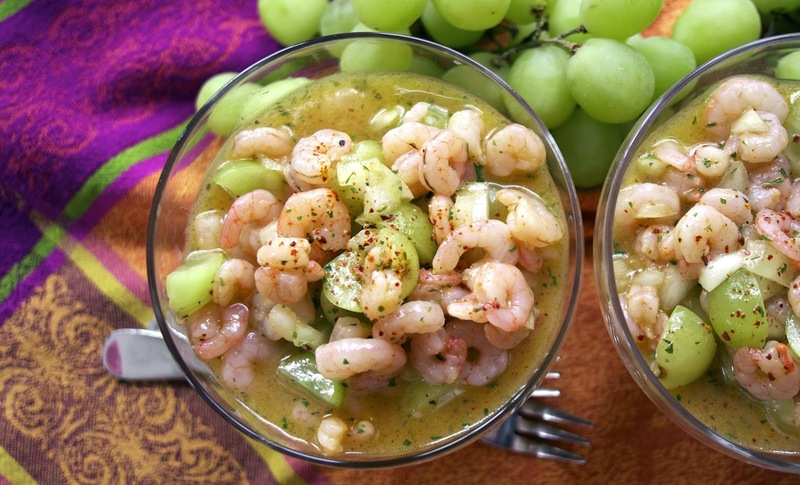 Pour marinade over shrimp and grapes, mix and let refrigerate for an hour before serving. I like the sound of your version, and it looks delish. I think you and I are sisters, Diane. I just flat out don't like to "lunch with the ladies". Don't get me wrong. I love the ladies. Just don't want to break up my day (so Type A) to have lunch with them. And, yes, I've been called "rude". When I do have lunch out, it's very special (for me). 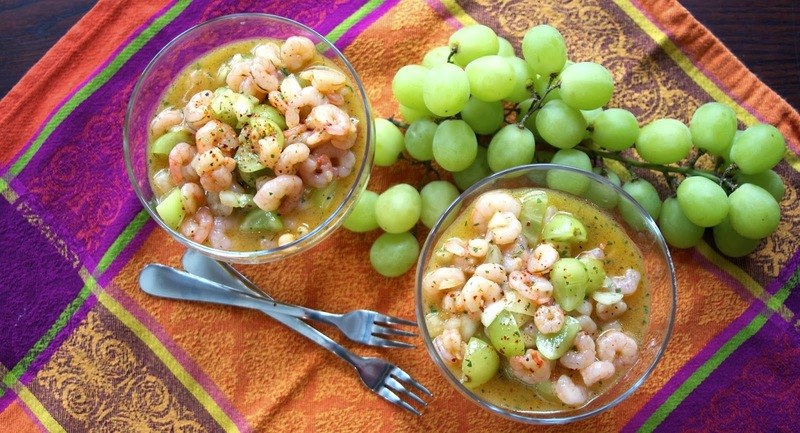 I think shrimp might be a great substitute for me with this ceviche recipe (which I didn't make). I probably would like all Dorie's marinade flavors but certainly understand why it didn't appeal to your kids' rather sophisticated palates. Nice variation. Well-done. I'm happy that Food Gawker is spotlighting many of your recipes. Good for you. I don't mind going out for lunch, but it needs to be substantial. I couldn't image you ever being called, "rude", "busy" but not rude. My kids are pretty open to a lot of different types of food, Mexican is popular with all teens I think... so the cilantro take would have gone over better. Thanks about Foodgawker, it is a great site that does bring a lot of people to your blog, very picky about pictures. Diane, I have to admit I love 'ladies lunch' but like you, I would stop off for the rest of the meal! A cocktail or wine at lunch is one of my great pleasures as it makes me feel like I'm on vacation. You were very clever to use cooked shrimp. Had I thought of it I would have tried this recipe. Like you, again, I have no trusted fish market for raw fish! Not let's get this clear it is Mary who doesn't do lunch. I lunch, but I don't lunch daintily. I agree a nice glass of, I like champagne... and a chat with an old friend is a real vacation. The funny thing is these days it's my husband who says, "I'll just have the salad." I still like a good hearty lunch. I can eat a light dinner... make me wish I was back in Paris. I like to eat like an European. Thanks Liz I bet you put on a fabulous luncheon... one that I wouldn't go away hungry. I loved this post, Diane! I would've been so pissed at that lunch. I hope at least there was lots of wine to make up for the lack of food. :) I agree that I wanted something a bit more for the ceviche, and likely due to our palates being used to Mexican food. In most of my experiences with European palates, spicy hot is not something that is appreciated: we were so frustrated at a cooking class in India because the other people--Spaniards and Italians--wanted mild food and thought even that was too much. Sigh. Thanks for the tip re salad shrimp as that sounds like an easy substitute! No wine at the lunch. Really the Spanish and Italian wanted mild? Both use red pepper? They must have been Northern Italian, my family is Southern Italian and we grew up eating many spicy seafood and pork dishes. 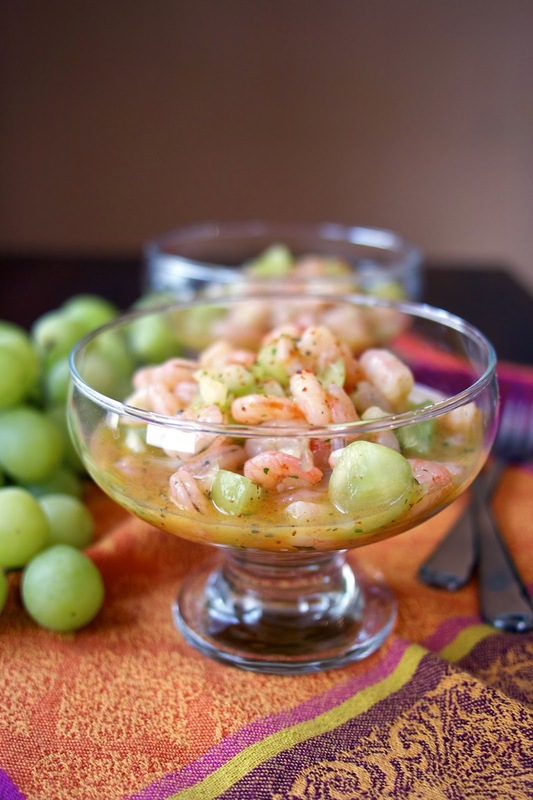 Diane, shrimp also sounds lovely in this recipe - and your presentation is so very pretty with all those fresh green grapes - I can understand that you thought this Winter Ceviche to be on the rather "sweet side". It is a challenge. I now say tonight is a Julia dinner, or tomorrow will be a Henry dinner, so everyone gets one meal that truly fits their tastes. were taken I tossed them into the fry pan and enjoyed them. I don't think Dorie would be upset. Whatever works????? I don't think that most people in general follow recipes exactly... especially if you are a good cook you feel even more comfortable changing things to fit tastes. I love to lunch with the ladies, but like you I want it to be substantial! Our lunches in NYC were quite good, and the company was fabulous! I skipped this one, because I just don’t do raw…and tossed in citrus juice does not constitute cooking to me! The flavors sound great…I prefer tarragon to cilantro! Great take on this one…the salad shrimp was a good idea! Your pictures and presentation are both lovely! Happy Sunday, Diane! I hope you aren't getting hit with the snow tonight too. I'm not a dainty luncher either. I was thinking this would be good with shrimp, so it's good to know it worked, even if it wasn't your favorite. I will definitely add some slices of jalapeno and maybe some more fruit. I think there's lots of ways to play with this one. I hope you're weathering the storm alright. Tonight, we're expecting another foot or two (or more)! I'm not a dainty luncher either. I was thinking this would be nice with shrimp, so I'm glad to know it worked. If I make it again, I'll add some slices of jalapeno, and maybe some diced mango. I hope you're weathering the storm OK. Not sure how much you are getting. We're expecting 1-2 more feet, at least. Stay warm! Well your shrimp salad looks delicious. What a great combination of ingredients. Thank you for sharing with the Clever Chicks Blog Hop! I hope you’ll join us again next week! oh yum! I've used tarragon in my tuna salad but never in shrimp salad. Can't wait to give it a try. If you are a tarragon fan you will enjoy this. This is a terrific brunch recipe or afternoon tea party! Thank you so much for linking it up at the "That's How We Roll Thursday" link party. I just loved your back story on the Shrimp Salad, I laughed so hard and I was right there with you! Thanks so much for sharing your talent with Full Plate Thursday. Wishing you a Valentine Day filled with Love! Happy Valentine's Day... I had a feeling you would like this post. I would agree... you are not a lady who lunches. A power lunch person yes. Aleppo great idea... I have some of that from the summer. My appetite has never been dainty either, Diane :-) Love your Shrimp Salad! I'm honestly not a fan of cerviche so this is perfect for me. The tarragon, mango and grape combo, along with your delicious dressing, sounds fantastic. I've featured your post at this week's Hearth and Soul linky party. Thank you for being a part of the hop. I don't think any of us who write about food are dainty eaters. My oldest sister eats like a bird and that's just because food is not a interest of hers.....? What a gorgeous salad! Thank you so much for linking up at Tasty Tuesday! Your recipe has been pinned to the Tasty Tuesday Pinterest board! Please join us again this week! Great story, Diane. 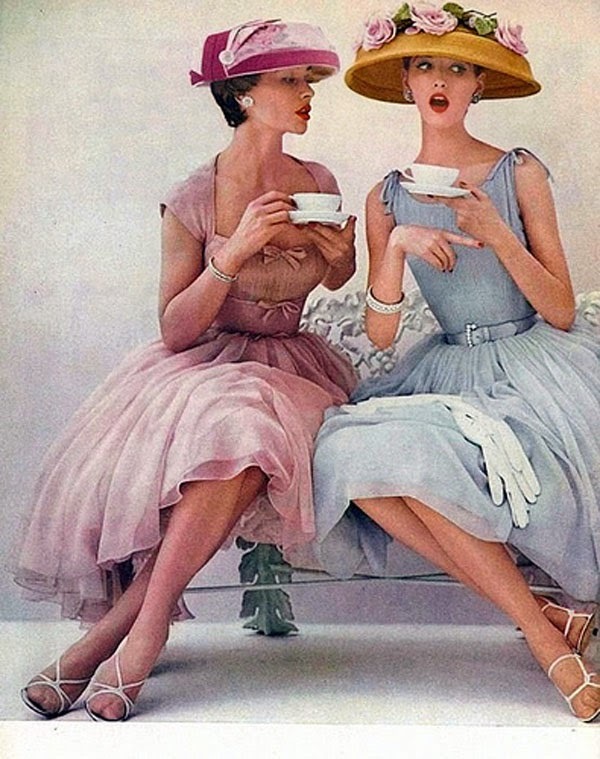 I'm not a lady luncher--in fact, I really hate that sort of thing. I like your changes to this recipe, leaving out the sugar and adding hot sauce. That's just my kind of lunch with the ladies.